I’ve only just talked about the importance of community and sharing knowledge in the virtualisation space at an internal meeting a few weeks ago. Low and behold the vExpert list has been published for 2016 and I’m glad to be part of it. The Tech field day series of events has now been running for a few years and I’m a big fan of the way companies are invited to pitch their solutions and roadmap faced with a panel of expert bloggers and experts in a particular field. These events are sponsored by Gestalt IT who are led by the vision that is Stephen Foskett (@SFoskett). The first annual VeaamON conference was held a couple of months ago in Las Vegas. If you weren’t lucky enough to attend then the Keynote and top 5 sessions, as voted by the attendees, have now been made available for consumption. Of course if you were lucky enough to attend then you will have access to all the sessions online. You lucky participants !! I can highly recommend the ‘Keynote’ and also the ‘Veeam v8 What’s New’ videos showing how Veeam has changed as a company and innovated to make it a leading differentiator in the Enterprise Backup space. As always, I’d recommend installing this in a Lab environment to get the most of the testing the new features before launching into your production update. I’m sure many backup admins and Virtual admins will be looking forward to the innovative features that come with this release and as always, read the product documentation before questioning how particular features work. Good luck !! Its been a long time coming but I hadn’t got time to publishing my final couple of days but wanted to get this out. Day 3 was all about my last few sessions and also talking to some more vendors. I attended a brilliant presentation featuring real customer cases all around D.R. and their business continuity processes and what they had learned in their various journeys. It was interesting that a representative from VMware was also on stage and they seem to always be learning from product sets and improving business processes internally which is refreshing to hear. I also talked to IBM at their stand and to Fortinet about their security solutions. Infinio was also on my list as I know they have a compelling acceleration product likened to the Pernixdata product. It was also an opportunity for me to view a demo of the free Veeam edition that can back up physical machines. I met up with Niels Engelen (who I already knew from twitter) who walked me through the product and it looks so intuitive and very similar to the standard Veeam interface. Kudos to Veeam for finally exploring the need to backup the last few physical servers and also workstations that people may be considering. I attended the customary VMworld party later on that evening and got a chance to see Simply Minds on stage. Although I’m not a big fan of theirs its still live music and enjoyed the night conversing with a the vGeeks I’d met over the last few days. I must say the DJ was very good and they could have kept him longer than 10pm but the night had come to an end and it was time for me to go back to the hotel and pack. Day 4 was the final day and luckily I had packed the night before so was all set to check out on time and leave the luggage at the conference center. All went smoothly as I had done this before and for me this was just a final chance to attend the Solutions Exchange and also to try and meet one of two bloggers who I had met earlier in the week. It was uncanny that I saw so many people from the exhibition hall on the plane and many vendors. Wonder what the D.R. plan would be for losing that many key staff in one hit ??? I can say I thoroughly enjoyed the event and learned so much. It was great to meet new faces and old ones and I’m hoping to stay in closer contact with the bloggers I conversed with. Feet are a little sore from all the walking but this is part and parcel of walking the conference floors and should heal up soon. A slight delay in this blog post but couldn’t be avoided. Day 2 was all about VMware showing its journey and evolution in the SDDC (Software defined DataCenter) and Pat Gelsinger was covered off all the major software updates as well as the improvement of the partner ecosystem which now includes HP and HDS in the EVO Rail (Another converged infrastructure block) stack. This is designed more for the SMB space and I’m looking forward to hearing more about its bigger brother, EVO Rack, when it’s released. Sanjay Poonen took us through the EUC landscape and how the the new Horizon Flex solution will improve container desktops and also the local desktop offerings on both Mac and PC devices. Another great stage presence from Sanjay and he clearly showed his passion for the area he has been put in charge of. I made it a point to attend a few session yesterday on vRealize Ops Manager and then wanted to talk to some vendors at the Solutions Exchange. As always there are plenty of key players demonstrating their SDDC vision and how convergence is being shown. I talked to both IBM and Nutanix on their new platforms to tackle this. I met my good friend Yossi Siles from the storage team in Tel Aviv who walked me through IBMs vision for vVols and it’s good to know they are catching up with the competition (finally !!). I also had a good chance to talk to a Nutanix UK manager who took me through their webscale vision and their ever increasing market share in the hyper converged infrastructure area. I had some time booked with Nimble storage and it was good to have a deep conversation with Nick Dyer and Charlie Whitfield who are great spokesmen for the company.They explained their growth had increased over a year and have shipped over 700 units which is up from around 100 last year. The Storage market is big enough for everyone to take a segment of revenue and Nimble seem to be doing very well with a wider range of storage units to meet both performance and capacity demands. Very impressive !! I also took part in the ‘Destination Giveback’ initiative. This is designed for VMworld attendees to donate to charity through the VMware foundation. Simply put, fly a paper airplane as far as you can and this equates to Euros that you can decide to allocate funds to a category such as Children, Women, Health etc. 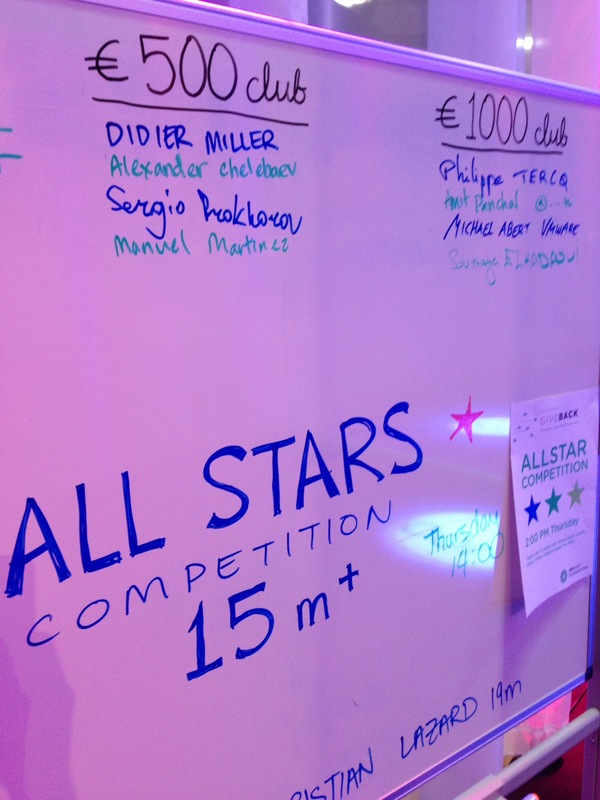 I was lucky enough to hit the €1000 mark and go straight on the leaderboard. Skills in aeronautical design I guess ?? Finally, I managed to attend the annual Veeam party that was very mellow until Ratmir Timashev (Veeam CEO) grabbed the mic and thanked his partners and customer base. It was a lot more vibrant after this but I had left early in order to get some rest before Day 3 and rest my aching feet. Stay tuned for more from a Day 3…. Its just over a week before I jet off to Barcelona for the annual get together with like minded virtualization enthusiasts. I won’t be listing all the sessions I am attending but am looking forward to more networking and community sessions this year. Not to be missed are the vBrownBag sessions – vBrownBag TechTalks. These are great community led presentations and very different to the standard sessions you find at the event. I’ve also volunteered to be on the vExpert panel on Wednesday so why not come and embarrass me further by watching. Be sure not to cram too much into the day as you’ll find that the community and networking elements of the event are great to share ideas and catch up with people you only know by their twitter handles. You can catch me in sessions / blogger area / various parties (vRockstar, Pernixdata, Veeam etc.) and I hope to meet some new faces and introduce myself as more than a twitter bod. If you see me, come and say Hi. I’m not your conventional blogger as I’m a manager and not a consultant or an Ops guy so you may learn something about being on the other side of I.T. VMworld 2014 US is imminent. What’s next ? Indeed what’s next and what can we look forward to the US conference starting in a few days. I won’t be there myself but have the fortunate pleasure of gracing the European conference again this year. On the plus side this means that I’ll be able to follow the conference in the US very closely and bring you the stories that count. I see some great new innovation from VMware themselves especially around the vSphere core changes and a certain Project Marvin…Its also going to be jam packed with vendors with an interest in Storage and computer acceleration in the datacenter in order satisfy the need for virtual machines to work faster and with less latency eliminating the favourite storage bottleneck. I’m looking forward to seeing posts from some of my favorite bloggers who are out there but I’ll be sure to provide my own thoughts as well as content links from other bloggers in the field so stay tuned. I’ll leave you with this thought. If last year was the year of VDI or SDN or any other acronym you can think of, could this be the year of all things Air ? Let’s see how branding and marketing play an important role in the festivities that lie ahead. The 2014 results are in for the Top Virtualization Blogs and I’m so glad I am featured (in one way or another) on Eric Siebert’s results page. I created my blog less than a year ago and have already had some varied and interesting visitors from the virtualization and technology community. Thank you for reading so far and I hope to improve on my performance so I can be a real community contributor over the next year. Please keep reading as I continue to grow my personal blog and as always appreciate any feedback on my journey to sharing useful and exciting content.